MagPortal.com® is a search engine for online magazines. It started on 28 March 2000, since January 19, 2016 no new articles are added anymore. The site is available until today (2019). The content of more than 100 magazines for the period from 1998 to 2016 can be searched. MagPortal.com was developed by the American Hot Neuron LLC, a software developer specializing in text analysis. MagPortal.com uses the Hot Neuron Similarity software which determines the similarity between texts and allows the user to view similar articles. 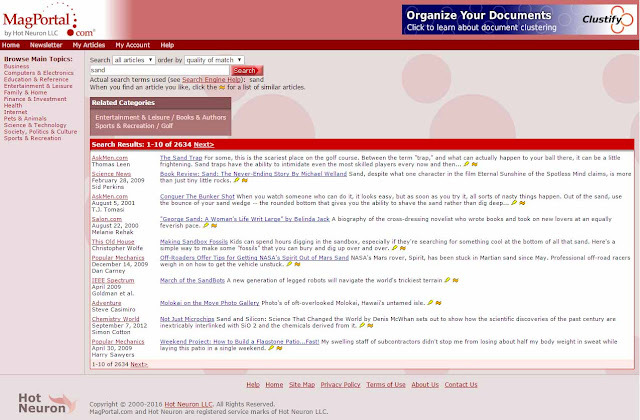 In addition, registered users can mark articles and add them to their own article collection. 2000 - [...] Hot Neuron LLC.